Using Silverlight and XAML, you can bind to a collection of data. Once that is done, you can then sort, filter, or group the data using a collection view. A collection view is similar to a layer on a binding source collection. It enables you to navigate and display the source collection based on queries to sort, filter, and group data, without having to change the underlying source collection itself. If a source collection implements the INotifyCollectionChanged interface, the changes raised by the CollectionChanged event are transmitted to the views. A single source collection can have multiple views associated with it. 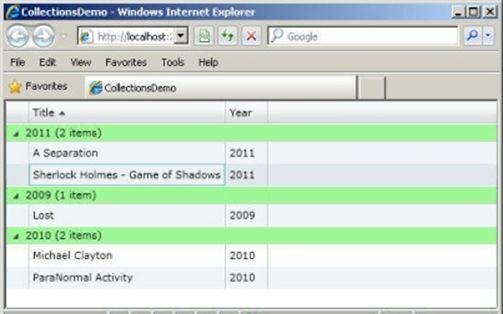 Create a Silverlight application named CollectionsDemo. Add the following markup to MainPage.xaml. The above markup creates a DataGrid and sets its ItemsSource property. The markup also sets style for the DataGrid rows. You will first create a PropertyGroupDescription object and pass the name of the property based on which sorting or grouping will take place. Then, add the PropertyGroupDescription to the SortDescriptions or GroupDescriptions collection of PagedCollectionView depending on which operation is to be performed. These actions are done using the above code. On executing, the output will be similar to Figure below. As you can see, the movie details are grouped by year and sorted according to title. In this post I am going to describe a solution to the following problem. I would like to create a single WCF Service and expose it via a standard SOAP endpoint and REST endpoint using Entity Framework, WCF and WCF REST. Then I would like to consume it from WinRT from two different view models working against the same view. This is an exercise of research into data options in WinRT. Now, the service. I am just going to perform basis CRUD opertions. The key to the service is my interface that I am going to decorate with both SOAP(OperationContract) and REST(WebGet or WebInvoke) attributes. Now, the part that took me the longest to figure out: web.config. As you can see above, SOAP endpoint comes first, and it is using basicHttpBinding. My REST endpoint is second, and it is using webHttpBinding I am asing a behavior configuration to the latter one, enabling webHttp get/post methods. This is all nice and simple, and you can now test it in browser. Today, I am documenting REST consumption. I am using HttpClient class to accomplish this task. For example, here is how I am going to get the list of sessions. A few points about the code above. I should have wrapped the call inside Try/Catch, I am just skipping it for the sake of a demo and to minimize the code I am showing. I am using standard serializer to convert my JSON message into an object. I also have a little progress ring that is playing while server communication is going on, and that is what my IsBusy property above is bound to. Now, let’s take a look at Create/Update call. It is just as simple, but I am using Post method of HttpClient and I am creating a string content to post by converting Session object to JSON, again using the same serializer.